The “calibrated fMRI” technique requires a hypercapnia calibration experiment in order to estimate the factor “M”. It is desirable to be able to obtain the M value without the need of a gas challenge calibration. According to the analytical expression of M, it is a function of several baseline physiologic parameters, such as baseline venous oxygenation and CBF, both of which have recently been shown to be significant modulators of fMRI signal. Here we studied the relationship among hypercapnia-calibrated M, baseline venous oxygenation and CBF, and assessed the possibility of estimating M from the baseline physiologic parameters. It was found that baseline venous oxygenation and CBF are highly correlated (R2=0.77, P<0.0001) across subjects. However, the hypercapnia-calibrated M was not correlated with baseline venous oxygenation or CBF. The hypercapnia-calibrated M was not correlated with an estimation of M based on analytical expression either. The lack of correlation may be explained by the counteracting effect of venous oxygenation and CBF on the M factor, such that the actual M value of an individual may be mostly dependent on other parameters such as hematocrit. Potential biases in hypercapnia-based M estimation were also discussed in the context of possible reduction of CMRO2 during hypercapnia. Keywords: Calibrated fMRI, venous oxygenation, cerebral blood flow, cerebral metabolic rate of oxygen, brain. Blood-Oxygenation-Level-Dependent (BOLD) fMRI is based on MRI signal changes associated with indirect effects of neural activation . Increases in neural activity result in an increase in brain’s metabolism , which in turn activates neurovascular coupling pathways to cause vasodilation and augmented cerebral blood flow (CBF) and cerebral blood volume (CBV) . The amplitude and spatial extent of CBF increase are often greater than that of metabolism . Consequently, the activated brain regions are “over-perfused” and the blood oxygenation level is actually higher than that during baseline state. This difference in blood oxygenation level can be related to MR signal intensity via the paramagnetic property of the deoxyhemoglobin molecules . This fortuitous phenomenon is utilized for functional brain mapping. In the past two decades, much effort has been devoted to understanding the relationship between neural activity and BOLD signal with the hope of using BOLD signal to calculate back the neural signal. However, with a few exceptions under special circumstances [6,7], it has not been possible to establish a general relationship or model between neural activity and fMRI signal, due to the exceptional complexity of neural network and computation. On the other hand, the relationship among MR signal, hemodynamic response, and metabolism has been studied with more success [5,8-13]. To this end, it has been suggested that one can estimate the activation-induced changes in oxygen metabolism, often denoted by the index cerebral metabolic rate of oxygen (CMRO2), from experimental measures of BOLD signal, CBF and CBV in conjunction with theoretical models of BOLD effect [9-11,13]. Although oxygen metabolism still does not reflect the exact change in neural activity, it is nonetheless considered a better index in terms of signaling brain function and neural processing . At present, the most widely used quantitative BOLD technique is called “calibrated fMRI” [9,10]. This method uses a simplified BOLD model which only requires two experimental measures, BOLD signal and CBF changes, in order to calculate the relative changes in CMRO2. However, as a result of the model simplification, the calibrated fMRI technique uses a number of assumptions and also requires the knowledge of a calibration factor, “M”, that needs to be determined for each individual if not for each voxel. M is typically estimated by performing an additional calibration experiment while having the subject breath 5% CO2  or 100% O2 . It would be desirable to be able to obtain the M value without the need of a gas-challenge calibration, which would make the technique more feasible for neuroscience and clinical studies. According to the analytical expression of M, it is a function of two baseline physiologic parameters, baseline CBF and baseline venous oxygenation (Yv). Interestingly, both parameters have recently been shown to be significant modulators of fMRI signal and can explain a large fraction of intersubject variations in BOLD signal amplitude [15,16]. Here we measured baseline CBF using phase-contrast (PC) velocity MRI  and baseline venous oxygenation using T2-Relaxation-Under-Spin-Tagging (TRUST) MRI  in seventeen healthy subjects. M values were determined using hypercapnia calibration experiments while simultaneously acquiring BOLD and Arterial-Spin-Labeling (ASL) images . Possible correlation between M and the baseline measures was assessed. The relationship between M, baseline CBF and baseline Yv was also investigated in the context of biophysical models. where TE and A are constants related to magnetic field strength and imaging parameters; CBV0, CBF0 and Yv,0 are the baseline CBV, CBF and Yv, respectively; Hct is the hematocrit; α is the Grubb’s coefficient between CBV and CBF ; β is a coefficient related to vascular geometry . From Eq. (1), it can be seen that relative changes in BOLD signal, CMRO2 and CBF are closely related and experimental measurement of two of them can yield the estimation of the third parameter, provided that the M factor is known. The physiologic meaning of the M factor is well known: it is the maximum BOLD signal one can get from a voxel when (hypothetically) all deoxyhemoglobin molecules are displaced. Therefore, the M factor is related to how much deoxyhemoglobin the voxel contains at baseline. This can been from Eq. (2) which shows that the value of M is greater when the voxel contains more blood and the blood has higher hematocrit and less oxygen. At present, the value of the M factor is determined by a separation calibration experiment performed on the same individual with the same slice position [10,14]. Based on Eq. (1), one can readily appreciate that, if we apply a physiologic manipulation that changes BOLD and CBF but not CMRO2, the CMRO2 term in Eq. (1) will vanish. Then if we measure BOLD and CBF changes during the manipulation, the M factor can be calculated. 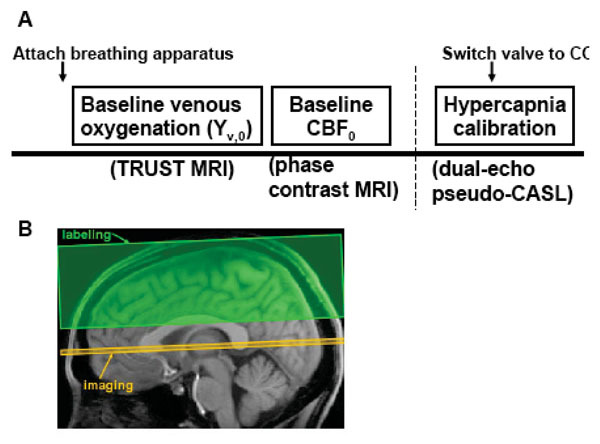 To date, virtually all calibrated fMRI studies have used this method to estimate M with the majority using hypercapnia [9,21] and a few using hyperoxia challenges . All parameter values discussed in this study are for the whole brain. The experiments were performed on a 3T MRI system (Philips Medical Systems, Best, The Netherlands). The protocol was approved by UT Southwestern Medical Center’s Institutional Review Board and informed written consent was obtained from each participant. The body coil was used for RF transmission and an eight-channel sensitivity encoding (SENSE) head coil was used for receiving. Foam padding was used to stabilize the head and minimize motion. A total of eleven healthy subjects (5 men and 6 women, 28 ± 3 years of age) participated in this study. Fig. (1A) shows the experiment design of the study. Global baseline venous oxygenation was measured using a TRUST MRI technique . The TRUST technique uses spin labeling principle to isolate pure venous blood signal, then determines the T2 of the blood, from which the oxygenation level was estimated. Fig. (1B) shows the slice position of TRUST MRI. 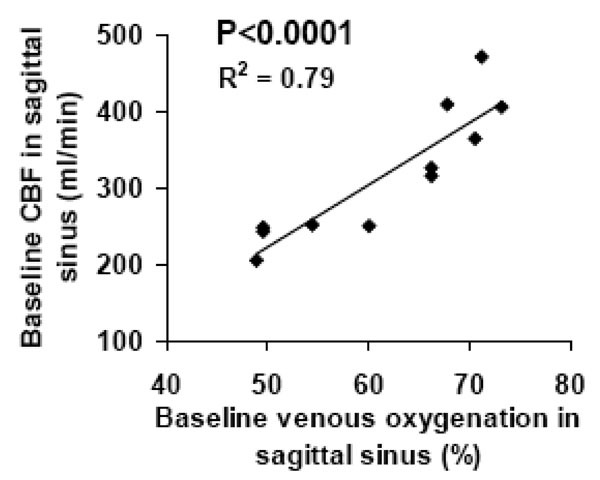 In this study, the experiments were performed at the level of sagittal sinus (SS), essentially measuring the oxygenation level of venous blood that is drained by SS. SS was chosen over the jugular vein because imaging at the SS is more robust and shorter in duration (critical for maintaining constant physiology during the measurement) . Previous studies have shown that venous oxygenation is spatially homogeneous at baseline [24,25], thus Yv,0 measured at the SS should presumably reflect that of the whole brain. The imaging parameters for TRUST MRI were: single-shot EPI, axial plane, voxel size = 3.44x3.44x5mm3, field of view (FOV) = 220x220x5mm3, repetition time (TR) = 8000ms, echo time (TE) = 7ms, inversion time (TI) = 1200ms, tagging slab thickness = 80mm, gap between imaging slab and tagging slab = 20mm, four different T2-weightings with eTE of 0ms, 40ms, 80ms and 160ms, corresponding to 0, 4, 8 and 16 refocusing pulses in the T2-preparation (τCPMG = 10 ms). For each eTE, four pairs of tag and control images were acquired to improve signal-to-noise ratio (SNR). The total scan time of TRUST MRI is 4 minutes and 16 seconds. Experimental protocol for the study. A) Experiment design. Before the subject enters the magnet, breathing apparatus (including mouth piece, nose clip, end-tidal CO2 sampling tube) was attached to the subject. Following survey and reference scans, TRUST MRI was performed to measure baseline venous oxygenation. Phase-contrast velocity MRI was used to measure CBF. Finally, pseudo-continuous ASL sequence was used with two echoes to simultaneously measure BOLD and CBF signal changes during hypercapnia challenge. During the ASL scan, the subject breathed four minutes of room-air. Then the gas valve was switched to CO2 gas mixture and the scan continued for another six minutes. The first two minutes after the switching was considered transition time and the data acquired were not used in the analysis. B) Position of imaging slice and labeling slab for TRUST MRI. The labeling slab is above the imaging slice for venous blood labeling. A relatively large gap (2 cm) between the imaging slice and labeling slab was used to minimize the saturation of labeling pulse on the imaging slice. This gap is not expected to affect the venous blood signal intensity as the flow velocity in these veins is relatively high (~16 cm/s) and the blood in the gap would have flown out of the imaging slice by the time of acquisition. Global baseline CBF was measured with the phase-contrast velocity technique . The slice again was positioned at the level of sagittal sinus. Note that the blood flow in the sagittal sinus is about 50% of that of the whole brain. But this scaling factor can be combined with the constant A and should not affect the relationship between baseline CBF, baseline venous oxygenation and M. The following parameters were used: single slice, voxel size = 0.45x0.45x5 mm3, FOV = 230x230x5 mm3, maximum velocity encoding = 80 cm/s. The scan duration was 30 seconds. For comparison, a conventional hypercapnia-calibration experiment was performed. A two-way non-rebreathing valve/mouthpiece combination (Hans Rudolph, 2600 series, Shawnee, KS) was used to deliver a 5% CO2 solution (balanced with 21% O2 and 74% N2; contained in a Douglas bag) for hypercapnic induction. A capnograph device (Capnogard, Model 1265, Novametrix Medical Systems, CT) was used to monitor end-tidal CO2, and a pulse oximeter (MEDRAD, Pittsburgh, PA) was used to monitor breathing rate, heart rate, and arterial oxygenation saturation. Values from both devices were recorded on a Lenovo tablet PC running the Microsoft Vista operating system and using HyperTerminal (Private Edition, Version 6.3, by Hilgraeve, Monroe, MI) for data collection. For imaging acquisition, simultaneous BOLD and ASL acquisitions were used to obtain BOLD and CBF changes concomitantly. The sequence was a pseudo-CASL method [26,27] with two echo times (TE) at 11 and 30ms, respectively. The subjects breathed room air for 4 minutes and 5% CO2 for 6 minutes. The other imaging parameters for PCASL were: Flip angle=90°, 16 slices, thickness 5 mm, orientation transverse, TR=4 s, 150 volumes. The data processing procedures for TRUST MRI and phase contrast MRI were based on an algorithm described previously [18,23]. Briefly, after pair-wise subtraction between control and tag images, a preliminary region-of-interest (ROI) was manually drawn to include the sagittal sinus. This ROI tended to have about 30-50 voxels which include the vein as well as some surrounding tissue. To further define the venous voxels, the voxels with highest blood signals (according to the difference signals) in the ROI were chosen as the final mask for spatial averaging. For the purpose of standardizing protocol, we use 4 peak voxels in this study, although we have tested the effect of voxel number and found that the results are relatively insensitive to the voxel number . The venous blood signals were fitted to a mono-exponential function to obtain T2. The T2 was in turn converted to Yv via a calibration plot  obtained by in vitro bovine blood experiments under controlled oxygenation, temperature and hematocrit conditions [28,29]. For phase-contrast MRI data, a preliminary ROI was drawn on the sagittal sinus based on the magnitude image . A signal intensity threshold was then applied to the magnitude image to obtain the final vessel mask. The threshold was set to be 2 times the background noise. The final mask was applied to the phase image (velocity map) and the integration of the map (i.e. velocity x area) yielded cerebral blood flow in the unit of ml/min. We have tested the inter-rater variability of this processing procedure and found that the results are highly consistent across raters. For the hypercapnia-calibration data, the two echoes were separately saved as different files. Motion correction was performed for each file (SPM, Wellcome Department of Imaging Neuroscience, University College London, London, UK). In-house MATLAB scripts were used to conduct surrounding subtraction of the control and label images in the first echo and to calculate the CBF weighted images. An ROI containing the whole brain tissue was manually delineated on the BOLD images (the second echo). The ROI was applied to the CBF weighted images to obtain a time course of CBF, from which ∆CBF/CBF0 between normocapnia (volumes 1 to 60) and hypercapnia (volumes 91 to 150) were quantified. Volumes 61-90 (2 minutes immediately following the gas switch) were considered transition time between the two states and were not included in the analysis. Similar methods were used to obtain the BOLD signal change, ∆S/SBOLD. The M factor was then calculated using the relationship described in the Theory section. We assumed alpha to equal 0.38 (based on Grubb et al., 1974) and beta to equal 1.33 (based on reports in Lu and van Zijl, 2005 that at 3T the relative contribution of extravascular and intravascular BOLD effect is 2/3 and 1/3, respectively ). Pearson correlation was calculated for each pair of the three parameters, baseline Yv, baseline CBF, and M. Using Eq. (2), baseline Yv and baseline CBF were also combined to provide a relative estimate of M and its correlation with the hypercapnia-calibrated M was assessed. We further conducted model fitting with baseline Yv, baseline CBF, and M as known variables and A, α and β as fitting parameters. Using this set of fitted parameters, the values of M were calculated again and its correlation with hypercapnia calibrated M was studied. Fig. (2A) shows a representative plot of venous signal (control-label in the sagittal sinus) as a function of effective TE from the TRUST data. It can be seen that the MR signal decays with TE and yields a good fitting to a mono-exponential model. For the entire group of subjects, the venous blood T2 (at τCPMG = 10 ms) was found to be 57.7±16.0 ms (N=11, mean±STD). Using an in vitro calibration plot, these values were converted to baseline venous oxygenation values of 61.6±9.4%. Figs. (2B-E) show representative images from phase-contrast velocity MRI. The outflow of blood in the venous vessels can be clearly seen in the velocity map (Fig. 2E). Baseline CBF in the sagittal sinus was found to be 317.1±85.8 ml/min. Fig. (3) shows a scatter plot between baseline venous oxygenation and baseline CBF across subjects. It can be seen that there is a significant correlation (P=0.0002) between these two physiologic parameters. Individuals with higher blood flow tend to have higher oxygenation in the venous vessels. Thus the baseline physiologic parameters in Eq. (3) are themselves inter-dependent. Representative data for TRUST MRI and phase-contrast MRI. A) TRUST MRI signal, i.e. 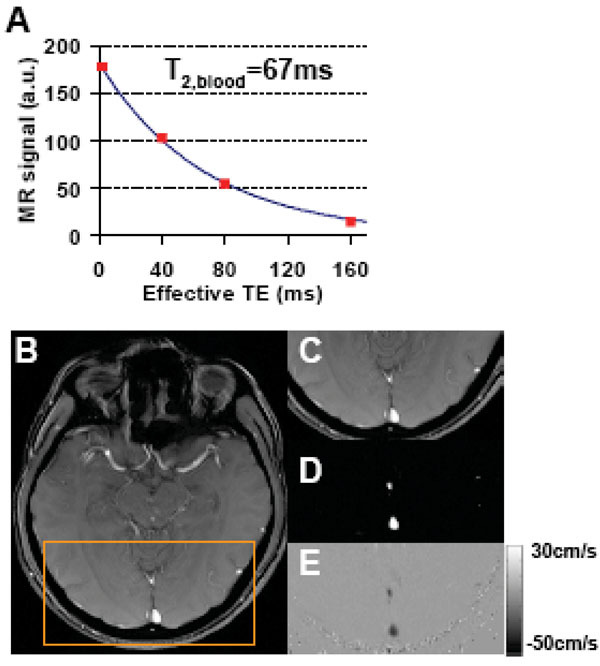 control-label, in the sagittal sinus as a function of effective TE. The symbol shows the experimental results. The solid curve shows the fitting of the data to a mono-exponential function. The time constant of the decay, i.e. T2 relaxation time of the blood, is also shown. B) Anatomical image from the phase-contrast scan. C) Posterior portion of the anatomic image highlighted by the orange box. D) Magnitude image of the phase-contrast scan showing large vessels as bright signals. The two bright regions indicate the superior sagittal sinus and the straight sinus, respectively. E) Velocity map. The flow in the veins is shown in dark color because the flow direction is downwards. Scatter plot between baseline venous oxygenation and baseline CBF across subjects (N=11). Each symbol represents data from one subject. The hypercapnia challenge increased the CBF and BOLD signals by 60.7±27.5% and 2.52±1.06%, respectively. Using Eq. (1), the M factor was found to be 0.074±0.019 (unitless), in good agreement with literature values at this field strength [21,31]. A spatial map of hypercapnia-based M is shown in Fig. (4). No previous studies have shown a map of the M factor. Note that the image appears blurred because the CBF/BOLD data were spatially smoothed (FWHM=12 mm) in order to improve SNR for reliable calculation. Even with smoothing, a few isolated spots (arrows in Fig. 4) still showed unusually bright or dark intensities due to erroneous BOLD or CBF signals in the presence of noise. Nonetheless, the majority of the voxels has reasonable M values and there is a clear contrast between gray and white matter, with gray matter manifesting a greater M value due to the presence of more vasculature. A representative map of the M factor. Eight slices are show. The data of BOLD and CBF were first smoothed before being used to calculate the M factor on a voxel-by-voxel basis. Arrows indicate regions where the estimated M values were clearly out of the reasonable range. This may be because of errors in the CBF and BOLD signals (e.g. decreased CBF and increased BOLD signal) which resulted in poor model fitting. Next, we studied the relationship between M and baseline venous oxygenation/baseline CBF. We found that the M factor is not correlated with either baseline venous oxygenation or baseline CBF (Fig. 5A and B). Furthermore, when using Eq. (3) to estimate the M values from baseline venous oxygenation and CBF (assuming α=0.38, β=1.33, Hct=0.4, TE · A = 0. 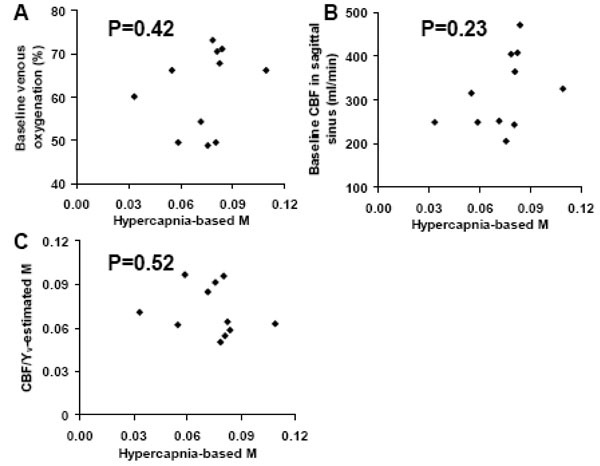 ), the estimated M and hypercapnia-based M were not correlated either (Fig. 5C). We then hypothesized that the lack of correlation between the hypercapnia-calibrated M and the baseline-parameter-estimated M may be attributed to incorrectly assumed values in α, β and A. Thus we conducted model fitting (Eq. (3)) with baseline venous oxygenation and CBF as independent variables and hypercapnia-calibrated M as dependent variable. The fitted α, β and A values were then used to calculate the estimated M. These M values were again not correlated with the hypercapnia-based M.
Scatter plots between variables in the model for the M factor. A) Scatter plot between hypercapnia-based M and baseline venous oxygenation. B) Scatter plot between hypercapnia-based M and baseline CBF. C) Scatter plot between hypercapnia-based M and baseline-parameter-estimated M. It was found that the hypercapnia-based M was not correlated with any of the variables associated with baseline physiology. In calibrated fMRI, the M factor is typically determined using hypercapnia challenge experiments [9,10,13,21,32,33]. On the other hand, the analytical expression of M suggests that it is related to baseline physiologic parameters of the individual. In the present study, we used non-invasive MRI methods to determine baseline venous oxygenation and baseline CBF, and aimed to estimate the M factor from these two measures. However, despite strong correlation among baseline venous oxygenation and CBF themselves, no apparent relationship was identified between them and the hypercapnia-calibrated M values. This was the case for the analysis of separate CBF or venous oxygenation or their combination according to the analytical expression. The exact reason for a lack of correlation between hypercapnia-based M and baseline parameters is not clear. The theoretical framework described in Eqs. (1-2) is based on well-established biophysical and physiologic principles of MR signal mechanism . Thus the definition and analytical expression of the M factor is thought to be valid. However, both experimental methods used to determine M may contain potential sources of error. The CBF/Yv-based method have primarily focused on the influence of these two variables on M, but did not account for intersubject variations in other factors listed in Eq. (3), such as α, β, and Hct. Therefore, the estimated M may be inaccurate due to one or several of the following reasons: 1) the effect of hematocrit was not accounted for and may be a significant factor in determining M; 2) the coefficient β is associated with vascular geometry and the relative contributions of intra- and extra-vascular contributions to BOLD effect, and could be region and subject specific; 3) we measured CBF instead of CBV (due to the need of contrast agent injection) and used Grubb’s equation to estimate CBV, but the relationship between CBF and CBV may be slightly different across subjects depending on perfusion pressure; 4) Total CBV was used in Eq. (2) but actually the more relevant blood compartment is venous CBV [8,11]. Similarly, the hypercapnia-based estimation method may have its own potential weaknesses. Hypercapnia-based calculation of M is based on the assumption that CMRO2 is not affected by CO2 inhalation. However, this assumption has recently been brought into question. In a study of macaque monkeys under anesthesia, Zappe and colleagues reported that hypercapnia induced a 15% reduction in resting state multi-unit neural activity in the primary visual cortex . While the authors did not measure CMRO2, it is possible that CMRO2 would also be altered under such circumstances. Several other reports done on brain slices provided further evidence at the cellular level that higher CO2 partial pressure can have a profound effect on neural tissue including reducing pH, elevating adenosine concentration, and suppressing synaptic potentials [35,36]. In a recently study conducted by our laboratory, we assessed potential effect of CO2 inhalation on CMRO2, resting state brain connectivity and electroencephalogram (EEG) in awake human subjects . It was found that inhalation of 5% CO2 caused a reduction of CMRO2 by 13%. The resting state BOLD signal that is thought to reflect spontaneous neural activiatity also reduced by 20% after accounting for vascular differences between normo- and hypercapnia states. The EEG study showed that the signal power was significantly increased in the delta band, accompanied by a significant decrease in the alpha band. Therefore, the relative EEG power was shifted toward the lower frequency range, a typical pattern of reduced brain arousal state . These evidences suggest that the M values as determined by hypercapnia calibration may contain bias compared to the true values. Interestingly, the consideration of possible CMRO2 reduction during hypercapnia may resolve the discrepancy between PET and MRI data in terms of the ratio of CBF and CMRO2 changes during brain activation [10,39,40]. The lack of relationship between M and baseline venous oxygenation and CBF can also be discussed in terms of the modulator on the BOLD signal. From Eq. (1), it is clear that M is the modulator of BOLD signal and the greater the M is, the greater the BOLD signal is. Previous studies from our laboratory have suggested that baseline venous oxygenation is also a significant modulator of BOLD signal, and individuals with smaller venous oxygenation tend to have a greater BOLD signal . This relationship is in line with the M factor effect because smaller venous oxygenation will result in a greater 1-Yv,0 term in Eq. (3), and a greater M. Baseline CBF has also been shown to be a modulator of BOLD signal, and individuals with smaller CBF tend to have a greater BOLD signal . However, this effect is actually opposite to the M factor effect. That is, a smaller CBF would result in a smaller M factor according to Eq. (3) and should result in a smaller BOLD signal. Therefore, it seems that CBF may counteract the main effect of M. Taking into consideration the finding that baseline venous oxygenation and CBF are positively correlated (Fig. 3), we speculate that the influence of venous oxygenation and CBF to the M factor may cancel out (that is, the Yv,0 term and CBF term in Eq. (3) tends to offset each other), and the actual M value of an individual may be mostly dependent on other parameters such as hematocrit. It is possible that the modulation effect of baseline CBF on the BOLD signal is exerted through terms in the bracket in Eq. (1) and the venous oxygenation effect on BOLD is in turn through its correlation with CBF. Hypercapnia-calibrated M factor is not correlated with baseline venous oxygenation or baseline CBF across subjects despite their links according to the analytical expression. The observation of a strong correlation between venous oxygenation and CBF may explain the above finding because the influence of venous oxygenation and CBF may have largely cancelled out. Another possible reason is related to the potential errors in the hypercapnia-based M estimation as CMRO2 may reduce during CO2 inhalation. Further study is needed to elucidate the true values of M and the best method to accurately estimate it. Attwell D, Laughlin SB. An energy budget for signaling in the grey matter of the brain J Cereb Blood Flow Metab 2001; 21: 1133-45. Roy CS, Sherrington CS. On the Regulation of the Blood-supply of the Brain J Physiol 1890; 11: 85. Vanzetta I, Grinvald A. Increased cortical oxidative metabolism due to sensory stimulation: implications for functional brain imaging Science 1999; 286: 1555-8.
 van Zijl PC, Eleff SM, Ulatowski JA, et al. Quantitative assessment of blood flow, blood volume and blood oxygenation effects in functional magnetic resonance imaging Nat Med 1998; 4: 159-67. Rees G, Friston K, Koch C. A direct quantitative relationship between the functional properties of human and macaque V5 Nat Neurosci 2000; 3: 716-23. Buxton RB, Frank LR, Wong EC, et al. A general kinetic model for quantitative perfusion imaging with arterial spin labeling Magn Reson Med 1998; 40: 383-96. Davis TL, Kwong KK, Weisskoff RM, Rosen BR. Calibrated functional MRI: mapping the dynamics of oxidative metabolism Proc Natl Acad Sci USA 1998; 95: 1834-9. Hoge RD, Atkinson J, Gill B, et al. Investigation of BOLD signal dependence on cerebral blood flow and oxygen consumption: the deoxyhemoglobin dilution model Magn Reson Med 1999; 42: 849-63. Lu H, Golay X, Pekar JJ, Van Zijl PC. Sustained poststimulus elevation in cerebral oxygen utilization after vascular recovery J Cereb Blood Flow Metab 2004; 24: 764-0. Kim SG, Ugurbil K. Comparison of blood oxygenation and cerebral blood flow effects in fMRI: estimation of relative oxygen consumption change Magn Reson Med 1997; 38: 59-65. Sicard KM, Duong TQ. Effects of hypoxia, hyperoxia, and hypercapnia on baseline and stimulus-evoked BOLD, CBF, and CMRO2 in spontaneously breathing animals Neuroimage 2005; 25: 850-. Chiarelli PA, Bulte DP, Wise R, Gallichan D, Jezzard P. A calibration method for quantitative BOLD fMRI based on hyperoxia Neuroimage 2007; 37: 808-20. Lu H, Zhao C, Ge Y, Lewis-Amezcua K. Baseline blood oxygenation modulates response amplitude: Physiologic basis for intersubject variations in functional MRI signals Magn Reson Med 2008; 60: 364-72. Liau J, Liu TT. Inter-subject variability in hypercapnic normalization of the BOLD fMRI response Neuroimage 2009; 45: 420-30.
 de Boorder MJ, Hendrikse J, van der Grond J. Phase-contrast magnetic resonance imaging measurements of cerebral autoregulation with a breath-hold challenge: a feasibility study Stroke 2004; 35: 1350-4. Lu H, Ge Y. Quantitative evaluation of oxygenation in venous vessels using T2-Relaxation-Under-Spin-Tagging MRI Magn Reson Med 2008; 60: 357-63. Grubb RL Jr, Raichle ME, Eichling JO, Ter-Pogossian MM. The effects of changes in PaCO2 on cerebral blood volume, blood flow, and vascular mean transit time Stroke 1974; 5: 630-9. Boxerman JL, Hamberg LM, Rosen BR, Weisskoff RM. MR contrast due to intravascular magnetic susceptibility perturbations Magn Reson Med 1995; 34: 555-66. Leontiev O, Buxton RB. 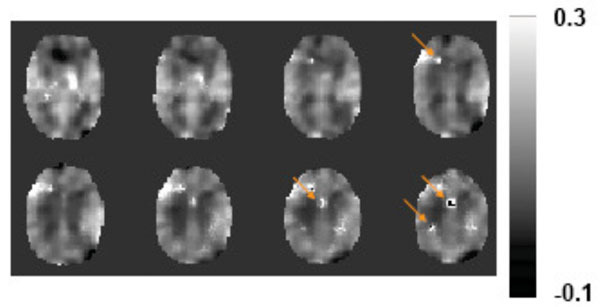 Reproducibility of BOLD, perfusion, and CMRO2 measurements with calibrated-BOLD fMRI Neuroimage 2007; 35: 175-84. Lu H, Law M, Johnson G, et al. Novel approach to the measurement of absolute cerebral blood volume using vascular-space-occupancy magnetic resonance imaging Magn Reson Med 2005; 54: 1403-1. Xu F, Ge Y, Lu H. Non-invasive Quantification of Whole-brain Cerebral Metabolic Rate of Oxygen by MRI Magn Reson Med 2009; 62: 141-8. An H, Lin W, Celik A, Lee YZ. Quantitative measurements of cerebral metabolic rate of oxygen utilization using MRI: a volunteer study NMR Biomed 2001; 14: 441-7. He X, Yablonskiy DA. Quantitative BOLD: mapping of human cerebral deoxygenated blood volume and oxygen extraction fraction: default state Magn Reson Med 2007; 57: 115-26. Wu WC, Fernandez-Seara M, Detre JA, Wehrli FW, Wang J. A theoretical and experimental investigation of the tagging efficiency of pseudocontinuous arterial spin labeling Magn Reson Med 2007; 58: 1020-7. Dai W, Garcia D, de Bazelaire C, Alsop DC. Continuous flow-driven inversion for arterial spin labeling using pulsed radio frequency and gradient fields Magn Reson Med 2008; 60: 1488-97. Lu H, Clingman C, Golay X, van Zijl PC. Determining the longitudinal relaxation time (T1) of blood at 3.0 Tesla Magn Reson Med 2004; 52: 679-82. Zhao JM, Clingman CS, Narvainen MJ, Kauppinen RA, van Zijl PC. Oxygenation and hematocrit dependence of transverse relaxation rates of blood at 3T Magn Reson Med 2007; 58: 592-7. Lu H, van Zijl PC. Experimental measurement of extravascular parenchymal BOLD effects and tissue oxygen extraction fractions using multi-echo VASO fMRI at 1.5 and 3.0 T Magn Reson Med 2005; 53: 808-16. Ances BM, Liang CL, Leontiev O, et al. Effects of aging on cerebral blood flow, oxygen metabolism, and blood oxygenation level dependent responses to visual stimulation Hum Brain Mapp 2008. Uludag K, Dubowitz DJ, Yoder EJ, et al. Coupling of cerebral blood flow and oxygen consumption during physiological activation and deactivation measured with fMRI Neuroimage 2004; 23: 148-55. Chiarelli PA, Bulte DP, Piechnik S, Jezzard P. Sources of systematic bias in hypercapnia-calibrated functional MRI estimation of oxygen metabolism Neuroimage 2007; 34: 35-43. Zappe AC, Uludag K, Oeltermann A, Ugurbil K, Logothetis NK. The influence of moderate hypercapnia on neural activity in the anesthetized nonhuman primate Cereb Cortex 2008; 18: 2666-73. Dulla CG, Dobelis P, Pearson T, et al. Adenosine and ATP link PCO2 to cortical excitability via pH Neuron 2005; 48: 1011-23. Gourine AV, Llaudet E, Dale N, Spyer KM. ATP is a mediator of chemosensory transduction in the central nervous system Nature 2005; 436: 108-1. Xu F, Uh J, Brier MR, et al. The influence of carbon dioxide on brain activity and metabolism in conscious humans J Cereb Blood Flow Metab 2011; 31: 58-67. Kiloh LG, McComas AJ, osselton JW. APPLETON-CENTURY-CROFTS Clinical Electroencephalography 1972. Fox PT, Raichle ME. Focal physiological uncoupling of cerebral blood flow and oxidative metabolism during somatosensory stimulation in human subjects Proc Natl Acad Sci USA 1986; 83: 1140-4. Fox PT, Raichle ME, Mintun MA, Dence C. Nonoxidative glucose consumption during focal physiologic neural activity Science 1988; 241: 462-.